Is My Puppy Too Thin? As a responsible pet owner, you need to be aware of your dog’s growth progress, from puppyhood to adulthood, to make sure that he stays in the best shape for the rest of his life. One of the things that you should do is to keep a weekly record of his weight until he reaches his 1st birthday. This is important in order to determine whether or not you have to modify his diet. 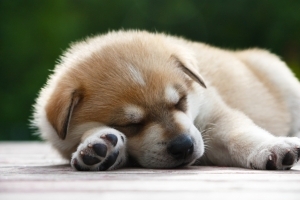 A chubby puppy may look cute and cuddly, but he is at great risk of developing joint problems or a bone disease. On the other hand, a puppy who is not eating his required daily meal may be experiencing an illness by type of food he is eating. If you have a large-breed puppy, he should be at least 2 years old before you can see a dramatic growth in his size. Obese puppies lead to obese dogs. The best way to find out if your puppy is overweight or underweight is to feel his ribs. The correct way to do this is to position your puppy on the table. Place one hand on his right shoulder and the other on his left shoulder. Next, feel his ribs by applying a gentle press using the palm of your hand. You should be able to feel his ribs with just a little bit of fat and muscle. If you are having difficulty locating his ribs, then your puppy may need to shed some pounds. On the other hand, if you have no trouble finding every single rib in his body, you may have to add a little bit more calorie to his diet. If your puppy needs to lose some weight, the best way to handle the situation is to make an appointment with your vet. Your vet will give you specific instructions that you must implement on a day-to-day basis. Your puppy will probably be given a special diet designed specifically for weight loss, one that is going to satisfy his appetite and contain required nutrients that his body needs while helping him lose weight at the same time. Your vet may also recommend regular exercise to help those extra calories. These include walking, occasional running, and lots of playing. Are Carbs Making Your Dog Fat?